Water Calendar 2013 – a journey into the Mysteries of Water, is a beautiful (30x24cm) wall calendar, with fascinating images on water, and inspiring texts on alternative water research. 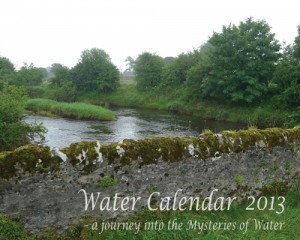 Order Water Calendar 2013 and join the journey into the Mysteries of Water. Price: $ 7.55 (approx. £ 5.00 / SEK 50:- / € 6.00) + P&P. You can also order it from Adlibris (in Sweden) or Bokus (in Sweden). “With the mind of a scientist and the heart of a poet, we embark on a journey into the realm of water. A journey that will take us from Viktor Schauberger’s unconventional river restoration to D’Arcy Thompson‘s ink droplets that mimic water-living species (or is it the opposite? ), from the self-organization of sand-water rolls at a beach to the reflections of an autumn pond, in our quest for water’s secrets. The calendar highlights in an easy and accessible language interesting examples of unconventional water research. In the calendar, we meet Viktor Schauberger’s unconventional river restoration and timber floating, flowforms, self-organization and flow patterns of water, water and climate change, the role of water in biodynamic agriculture, reflections on water quality, ice images of different kinds of water, research on the effects of consciousness on water, research on excess energy from water, and more. A survey of “out of the box” research on water, written in an inspiring language accessible for the general reader. 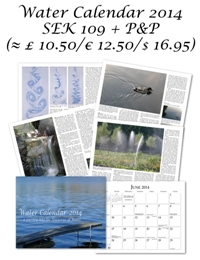 The images complement the texts and, of course, you can order the calendar just for the images themselves. Each month in the calendar contains a link. As a new month begins, a new page opens for the month at watercalendar.com, and by following the month’s link in the wall calendar you will find additional information and links related to the text. 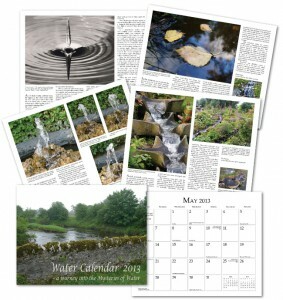 The calendar includes information on various dates associated with water (e.g. UN recognized days), public holidays of several countries (including those of Sweden, Norway, Denmark, Finland, Iceland, United Kingdom, Ireland, Germany, Netherlands, Belgium, France, United States, Canada, Australia, New Zealand and South Africa) and much more. Text, survey of research & photographic selection by Lasse Johansson, Institute of Ecological Technology. Photos & illustrations by Lasse Johansson, Dag Birkeland, Olof Alexandersson, Morten Ovesen, Hans van Sluis, Nigel Wells, Wojciech Puchalski, Gisela Ahlberg and Christina Weldero. Many of the research areas presented in the essays are covered by the IWONE (International Workshop on Natural Energies) conferences organized by the Institute of Ecological Technology. Water Calendar 2013 – a journey into the Mysteries of Water (ISBN 978-91-87197-00-0) is published by Alternativa Bokförlaget, Gothenburg, Sweden. Do you like the essays and images at watercalendar.com?